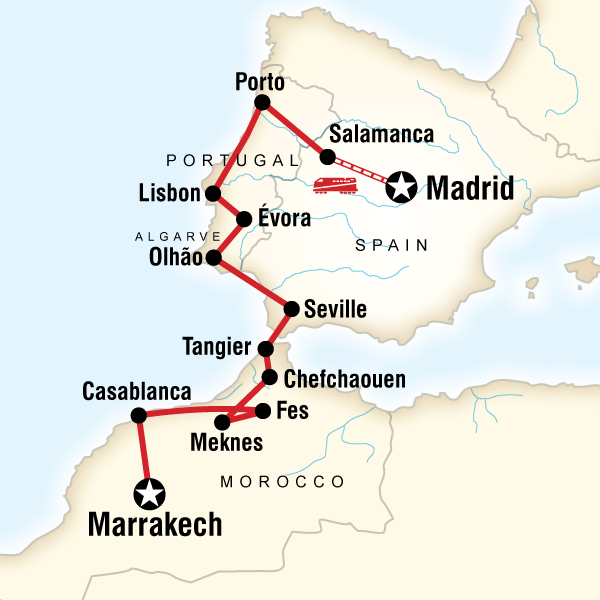 Discover the rich culture in the Iberian peninsula, home of Spain and Portugal. Surround yourself in the whitewashed architecture of a traditional “pousada” with an overnight in Évora, before exploring Spain’s fiery Andalucian capital of Seville. 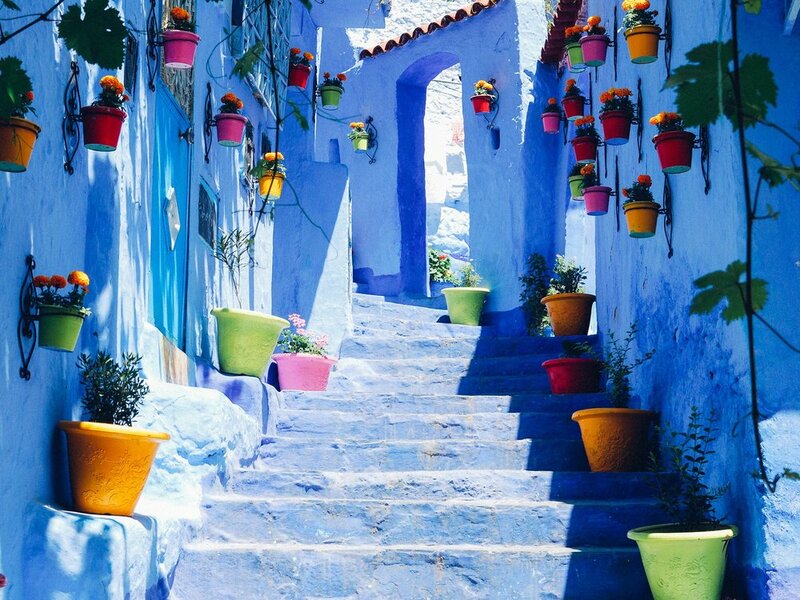 Cool it all down in Morocco, within the city of Chefchaouen’s striking blue walls. Explore the city of Madrid in 1 day: Palacio Real, Real Jardin Botánico or Escorial. Experience more nightlife at the Plaza del Dos de Mayo, in the area known as Malasaña. Taste some sangria and dance to the latest music. Transfer to Porto, stopping in the historic and charming town of Salamanca along the way. Journey to Portugal's capital city, Lisbon. Get lost in the city's winding streets lined with pastel coloured houses, palaces, majestic gardens and lush forests. Make a stop in Tangier for a tour of the medina before continuing on to Chefchaouen for the evening. The djellaba, the traditional hooded garment worn by the men and women of North Africa, was created here. Chefchaouen is reputaed for its typical ancient crafts. Travel to the imperial city of Meknes. Visit the ancient Roman ruins of Volubilis before continuing on to Fes. 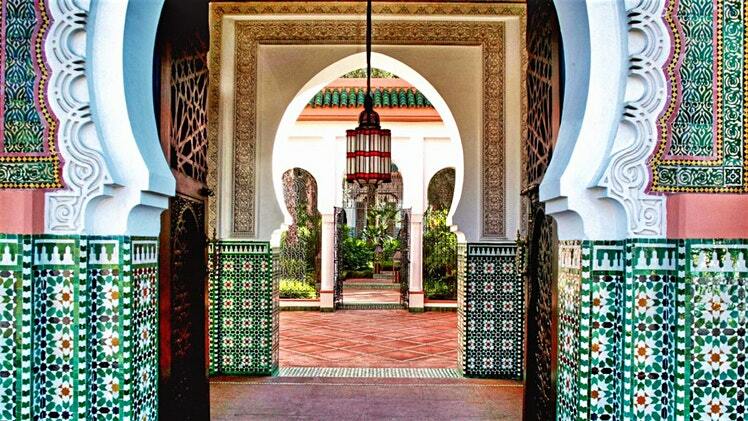 Spend half-day to visit the Fès medina. It the world’s largest living medieval medina and a UNESCO site. Explore the artisan quarters, sample treats from the carts, and view Fès' famous leather tannery. In the evening, opt for dinner in a converted riad complete with local specialties, music, and belly dancing.